The Delegation for Relations with the Korean Peninsula, created in 2004 and made up of 12 members and 10 substitutes, covers relations with both States on the Peninsula: the Republic of Korea (ROK) and the Democratic People's Republic of Korea (DPRK). Delegations maintain and develop Parliament’s international contacts while raising awareness about international issues among the members of the European Parliament (MEPs). Recent developments in the Korean peninsula include on one side a serie of new DPRK’s balistic missile tests and on the other side the deployment of the THAAD anti-missile system defence in South Korea. In reaction, several sanctions have been unofficially implemented by the People Republic of China which opposes such a deployment. Since the Foundation for Strategic Research recently published a research paper on this very issue, the Delegation asked Dr. Antoine Bondaz to give a testimony on the matter, on March 17, 2017 Antoine Bondaz, « La réaction chinoise au déploiement du THAAD, illustration du dilemme sud-coréen », Note de la FRS n° 9/2017, avril 2017. . What follow is the written transcript of his testimony. China-South Korea relations have greatly deteriorated since Seoul's decision in July 2016 to deploy the US anti-missile defence system THAAD. In South Korea, in various opinion polls, and for the first time in decades, Japan now has a more positive image than China. In that short presentation (10 min), I will start with a brief overview of North Korea’s nuclear and ballistic program and explain South Korea’s rationale to deploy the THAAD. Then, I will focus on China’s opposition and the sanctions the country has implemented against South Korea, before concluding on the dilemma Seoul faces. Pyongyang, despite its opaque nature, is predictable. For more than 20 years, North Korea has defied efforts of the international community and has remained uncompromising in its pursuit of nuclear weapons. North Korea pulled out of the Nuclear Non-Proliferation Treaty in 2003; revealed the construction of a uranium enrichment facility in 2010; conducted five nuclear tests in 2006, 2009, 2013 and twice in 2016; and conducted an unprecedented number of missile tests since 2014. Under the leadership of Kim Jong Un, North Korea has radicalized its position on nuclear weapons and institutionalized them. The Constitution has been revised in 2012, and the status of “nuclear power state” further enshrined in the so-called Byungjin line, which aims at “carrying out economic construction and building nuclear armed forces simultaneously”. Prospects for denuclearization are dim. The North Korean leadership no longer considers nuclear weapons as only deterrent weapons. They are also “identity weapons,” political weapons that reinforce the authority of Kim Jong Un, solidify the hereditary system since they are Kim Jong-il’s “revolutionary heritage” to Kim Jong-un, legitimate the sacrifices of the population for the last two decades, and boost national morale in presenting the country as an international technological power. It makes their abandonment even more difficult since they are no longer “possessed by the regime” but are “fully part of the regime’s identity.” To give them up would mean for the regime to deny the rationality of its former policies, which would in turn severely alter its legitimacy. Kim Jong-un has so far conducted more than 75 ballistic missile tests, key vectors to deliver nuclear but also chemical weapons. The last military parade presented new missile systems on a scale never seen before. Four missile systems were paraded for the first time, including two we had never heard off. The country seems to be seeking a program sophisticated enough to have a second-strike capability in case of a nuclear war with the USA. However, parading these weapons only proves North Korea’s ambitions, not its capabilities yet. The key highlight of the parade was a growing solid fuel capacity to signal significant developments in its ballistic capabilities. 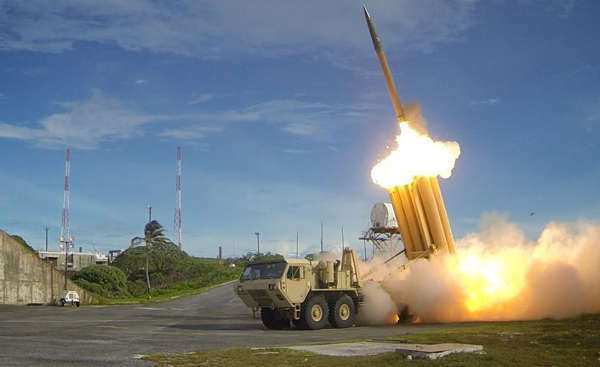 Solid-fuelled missiles means less support vehicles, less preparation time, what makes them harder to detect and to defend against, including by the THAAD. Facing a growing military threat, the question of the deployment of an anti-missile system in South Korea was first raised in the early 1990s. However, the deployment of the THAAD marks a turning point since it is a US missile defence system operated by the United States, and not by South Korea. The successive South Korean governments, including conservative ones, had so far rejected the proposal. On the opposite, all of them insisted on the need to develop a national system, the Korea Anti-Missile Defence System, which is not integrated into the US missile defence system, although based on US technology. As for the THAAD, South Korean governments initially relied on "three no": "no demand from the United States, no negotiation with the United States and no decision of the Korean government". The decision of President Park Geun-hye to formally launch negotiations with her ally in January 2016 is a turning point. It can be explained by both a security reason and a political one: President Park with little leverage in her hands to react to the fifth North Korean nuclear test in 2016 played her last two cards: THAAD and Kaesong. The Chinese opposition to the deployment of THAAD is not new. The reasons are diverse, related not only to the Sino-South Korean relationship but also to the Sino-US relationship. Three main arguments can be identified in official Chinese analyses and declarations. Firstly, the deployment of THAAD would have the effect of destabilizing the Korean Peninsula, pushing North Korea to further accelerate its nuclear and ballistic programs. Secondly, since THAAD is a US-controlled defence system already deployed in Guam and Japan, it would strengthen the US-South Korean alliance, the US military presence in the peninsula, and the de facto trilateralization of US bilateral alliances with Seoul and Tokyo, creating an "Asian version of NATO". Thirdly, Chinese experts are concerned not with the interception capability but with the surveillance capability of the radar. The impact is not a short term one but a long term one, challenging China’s nuclear second strike capability and weakening its nuclear deterrence. The radar would increase US capabilities for intelligence and early warning in the event of a nuclear conflict, and de facto enhance the US capabilities to intercept Chinese intercontinental ballistic missiles. Since the announcement of the deployment, China does no longer only rely on verbal opposition, and has implemented a series of sanctions. They cover Chinese imports of South Korean cosmetics, the Lotte conglomerate distribution network, or Chinese tourists to South Korea. These sanctions remain unofficial. First, they aim at sanctioning a political decision rather than an economic one. In the early 2000s, China had massively sanctioned South Korea to ensure that the country did not reintroduce tariffs on imports of Chinese garlic and kimchi. Second, calls for sanctions in the Chinese press, by the academic community but also by military experts, are unprecedented in their intensity. Third, these sanctions are very different from those imposed on Japan in September 2010, and indicate an evolution in China's sanction strategy. Economic sanctions currently targeting South Korea are better adjusted, more diversified and of a lesser intensity, while having an equivalent political impact. Fourth, China sanctions South Korea because it considers that the divergences within the South Korean political class play to its advantage, unlike in Japan. Fifth, China considers that its neighbour is facing a strategic dilemma and can then be influenced. These sanctions have an undeniable impact on South Korean public opinion. Moreover, a large majority of South Koreans supporting the Democratic party are opposed. However, it is unlikely that the election of the Democratic party candidate Moon Jae-in will impact the deployment. Indeed, the THAAD is already deployed. It is now difficult, if not impossible, for President Moon to withdraw it without undermining the alliance with the United States, appearing to yield unilaterally to China's pressure, and making North Korea the main beneficiary of the withdrawal. More broadly, the issue of THAAD reveals the dual dependency of a country that depends on the United States for its security and on China for its economy, just like a growing number of countries in East Asia. Indeed, South Korea is facing a strategic dilemma: the country must reassure and guarantee the security of its population that relies on the alliance with the United States formed in 1953, while maintaining good relations with China, its first economic partner and key player in solving the North Korean nuclear and ballistic problem. The official position of the South Korean governments since 1992 has been to seek a diplomacy of compromise between the two. As the candidate Park Geun-hye summed it up in 2012, "the United States is our ally and China is our partner. The problem of having to choose between the two does not exist ". However, China's pressure tends to force South Korea to adopt a diplomacy of neutrality rather than a diplomacy of compromise. The increasingly widespread feeling in Seoul that Chinese decisions have a negative impact on their security, the degradation of China's image in the eyes of the South Koreans, and above all the lack of cooperation to stop the growing threat posed by the North Korean nuclear and ballistic program, could impact Seoul calculations in the mid-term. President Moon will not drastically reverse his country’s foreign policy. He could adopt a more balanced diplomacy between Beijing and Washington, while boosting South Korea’s own defence capacities. His election is also a great opportunity to improve inter-Korean relations that are in “a-more-than-two-decades” low, following the closure of the Kaesong industrial complex in 2016. Can the European Union play a role? The European Union has a key role to play in lowering tensions and fostering dialogue by multiplying contacts with both South and North Korea, and hosting inter-Korean talks within the European Union. On the other side, the European Union must fulfil its international obligations into enhancing global non-proliferation mechanisms, including a better implementation of UN sanctions and assisting its partners in Africa, Asia and the Middle-East to do the same, while trying to reduce North Korea’s source of illegal incomes including from the so called « forced labourers ». The European Union and its member states could also seize the opportunity of the election of Moon Jae-in to help the country further balance its foreign relations what has been an objective, so far unfulfilled, of the last 2 conservative presidents.